Although all the photos sent in for the festive round of No Croutons Required where rather brilliant, we had a clear winner. 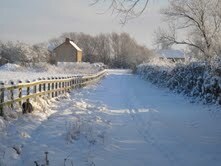 Snowy Days on the Farm, sent in by Sue over at Our New Life in the Country. Congratualtions Sue, it was a real picture postcard shot of winter. Sue wins a badge for her blog and also as this is the festive round, she wins a Christmas pressie too. If you would like to take part in the first No Croutons Required challenge for 2011, then head over to Lisa's Kitchen for details. HAPPY NEW YEAR EVERYONE! I hope 2011 is a good year for you. Doh ... I missed out on voting casue i couldn't decide which one I liked best! Good thing this one was on the list lol. Happy New Year to you and congrats to Sue. Thank you so much to everyone who voted for my picture. It has been lovely to take part in this great photo competition. I hope everyone had a lovely Christmas and wish everyone a Very Happy New Year. Thanks again, I will publish my badge with pride. Brilliant Blog by the way Jac, I am currently working my way through your archives, I am up to Aug 08 now, some fantastic recipes, my printer is working overtime!!) I have recently took the decision to be a 'proper' vegetarian after years of dallying about with just chicken and fish and find that Blogs like yours are helping me enormously...thanks. Congrats to Sue. it is indeed a beautiful photograph. Happy New Year to you Jac and your beautiful family. I have looked forward to your culinary journey Jaqueline and the promise of all that inspires me from your kitchen in 2011. Beautiful photo - well done Sue. Happy New Year! Look forward to seeing more of your recipes in 2011.